Minecraft is not just a game. It is a creative tool. Over the past year and a half countless epic builds, servers, and community projects have been undertaken. I'm sure some of you have seen the one-to-one scale recreation of the Starship Enterprise from Star Trek or the epic server Godcraft. Countless projects such as these are being worked on as we speak, and they serve to inspire us all. Have you found yourself inspired with a dream build while at a loss as to how to realize it? Are you lost in a sea of details, quick to give up on what might just be a great idea? Many who dream in block form encounter this obstacle, but there is good news for those who dream big. With a bit of organization and planning most any idea can come to fruition, and so this past Saturday's Weekly Workshop was all about the epic build and how to realize it. This week, I chose some generic build ideas just to present the basic premise of the scope, scale, time and effort required for your respective project ideas. There are many ways is to realize your ideas and I do not claim to understand them all, but from my experience on Minecraft projects and servers, I have elicited a method that is sure to help you along in the act of creation. The first step in any creative project is planning. For the purposes of this how-to, I will use the example of just one of this week's builds, The Great Pyramid of Giza, which we built on a 3:5 scale at about 60% of it's actual size. The first step in any creative project is planning. One cannot begin anything without first setting carefully in their mind what it is they wish to do. It is true that one cannot really plan enough, as there are sometimes endless details to cover, but there are some things you should always consider before you begin. How big will your build be? If your build exists in a world already—the real world, fantasy, or otherwise—to what scale do you wish to build it, 1:1 or 1:1000? What is most aesthetically important about your build? 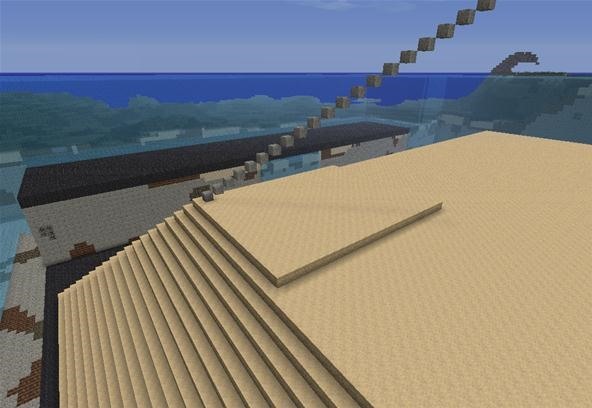 What, if any, limitations will you run into in accurately recreating your idea in Minecraft? The success of your projects depends greatly on practical aspects like size, time, and scale. 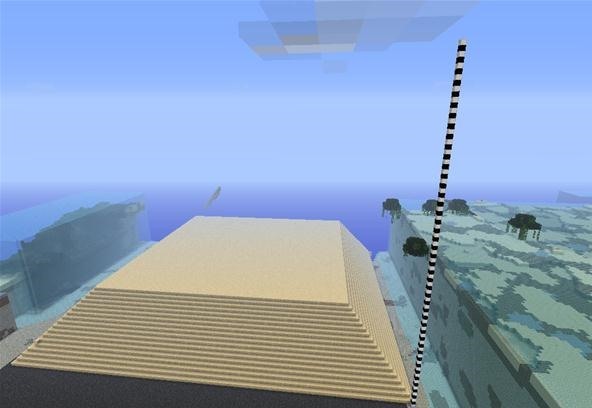 Size: The vertical limit to which you can place blocks in Minecraft is 128 blocks from bedrock. If your build is above this, then it's best to scale it down. Horizontally, however, the sky is the limit, so to speak. The Great Pyramid in Giza is 146.5 Meters tall and 200 meters wide on all sides. Since the proportional size of a Minecraft Block is a cubic meter, we will have to do some scaling. Time: How much time do you have for your project and how much are you realistically willing to spend on it? For our purposes, the time frame will be about 2-4 hours. Scale: Some builds are impressive for their detail, beauty or sheer volume. Consider scale carefully in what you want to accomplish size-wise. For my pyramid, I will have to scale it down quite a bit if I am to complete it in in decent shape and in a reasonable time. 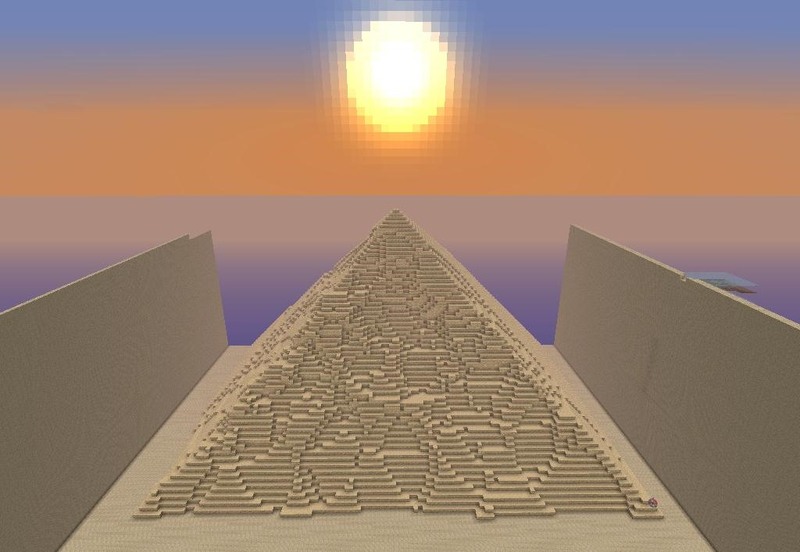 I will scale my pyramid to about 60% its original size, making it 87 meters (blocks) high and 120 meters wide. The more organic the shape of your build, the more difficult it can be to scale appropriately. Be sure to keep in mind that the smaller things get in Minecraft, less detail is possible. Once you have an idea of how large and to what scale you want your build, it's time to get building. Whether you are building alone or with a dozen people, organization is king. For builds that take a long time and require lots of detail, try breaking down each aspect of the build into sections and each section into a division of labor. With more players focused on less, you will run into less distraction and fewer mistakes. Be sure that everyone knows their purpose in the greater plan. Keeping labor divided and separating each stage of construction carefully is essential to completing a single vision accurately in a given span of time. Framers, to lay out sections of builds that require accuracy and detail. Fillers, for filling in the bulk of things like hills, walls, oceans, or whatever needs a mass fill. Landscapers, to ensure that the area surrounding builds look accurate to their environment and fit appropriately, whether your want the moon or Manhattan. Foreman, can be leaders that keep other players on task and help keep a well-managed work space. Keeping measurements around helps in keeping to scale as well. For our build, we laid out the steps first, making sure the overall shape was accurate before going ahead with filling them in. So while some of us filled in the layers, others built the form, while still others began the process of "aging" the pyramid. We used a methodical process of framing and filling to accomplish the desired effect. 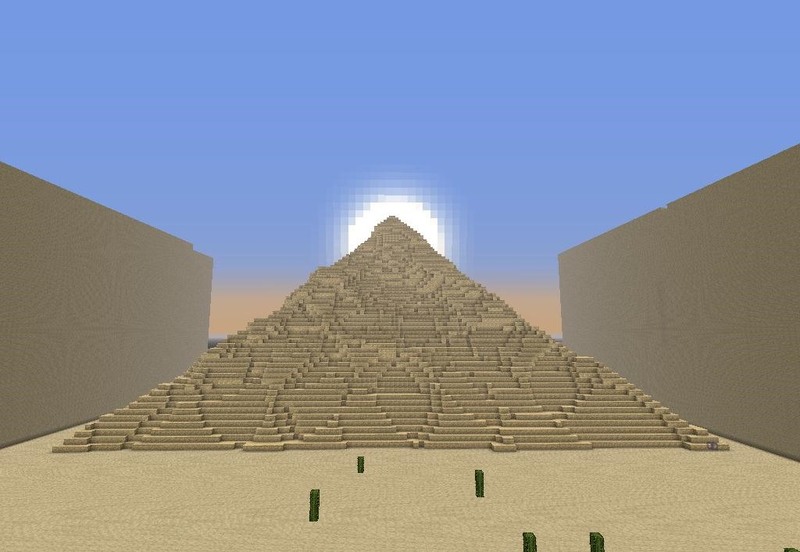 Of course, if you don't have the endless man power and time of the Pharaohs there are several mods and plugins available to make your work easier like Wolrd Edit and Voxel Sniper for servers, and SP Commands or MC Edit for single player. Completing your build within an accurate size or shape is one thing, but making it appealing or even beautiful is just as much a part of its epicness—and that's not something you can copy block for block. Aesthetic considerations of beauty, detail, and style will differ drastically depending on your project. Don't be afraid to deviate from planned things like scale or dimensions for the sake of a prettier facade. After all, you're more interested in something that looks great than something that boasts accuracy. Using block types creatively, i.e. snow can look like marble. Try using different texture packs or making your own to fit your project. Remember that unless your build is gigantic, less is usually more. Avoid trying to realize curved shapes, they don't really exist in Minecraft and it's often better to simply stick to the block-like motif of the game. Small details can go a long way in making an otherwise plain pyramid look exciting! When comes to style, practice is king. Experiment with new ways to build the same thing such as differing fashions of archways, windows, or foundations. In the case of our pyramid, adding a few cacti, some sand, and a few years of decay brings out a whole new element of aesthetic and realism. It's (kinda) like you're really there! Not all builds have to big to be epic. Epic is, after all, what you make it, whether it's a pyramid, a skyscraper, or a something from your imagination. There is much to be said about time, creativity and detail. A well executed cabin can look more impressive than a New York City block, if done with care and forethought. A combination of planning and teamwork can help you keep your vision in mind at all times, ensure success and more importantly, fun. It also helps to conceptualize on paper. Download a 50x50 grid or whatever is appropriate and find out the slopes and circular projections. It saves a lot of grief when you build something, step back, and find out that your build is crooked. Ver VERY nice build! :D seriously i like the eroded patterns alot <3. im trying to do a futuristic super construction but im having trubles deciding thte scale ._. As a builder myself, nothing I could have said could have led anyone through such a good step by step how-to.